Step Up 2 the Streets is the 2008 sequel to the 2006 movie Step Up. The movie is directed by Jon M. Chu, and is choreographed by Jamal Sims, Hi-Hat (Bring It On) and Dave Scott (Stomp the Yard). Patrick Wachsberger and Erik Feig of Summit Entertainment produce with Adam Shankman and Jennifer Gibgot of Offspring Entertainment and Anne Fletcher, the director of the original film. 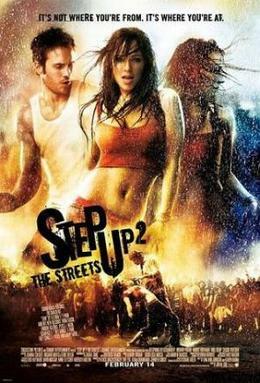 Step Up 2: The Streets, follows Andie (Briana Evigan) as she pursues her dream of becoming a dancer. Andie is passionate about dancing and rehearses regularly with her ‘crew’, the 410, to keep the title in the illegal competition of The Streets. Andie’s foster mother is tired of the crime and harassment of the 410 and tells Andie she will go to live with her aunt in Texas if she doesn’t turn her life around. Andie’s friend Tyler Gage (Channing Tatum) persuades her to audition for the Maryland School of the Arts, where Andie receives a place. When Andie’s studies come before the crew, the members are not happy and decide to drop her. Andie however has different ideas and forms her own crew to compete. Missy, joins the crew after dropping out of the 410 following Andie’s removal. Chase (Robert Hoffman) is the younger of two sons whose father started the Maryland School of the Arts. His whole family dances ballet but he has always wanted to compete at The Streets as a member of a hip hop crew. This was made possible when Andie joined the school. However, his ex-girlfriend Sophie (Cassie Ventura) becomes jealous. His older brother Blake Collins is the Director of the Maryland School of the Arts and is a very traditional ballet dancer. He doesn’t approve of Chase’s ambitions. Moose (Adam G. Sevani) is an eccentric teenage boy at the Maryland School of the Arts, studying a stage lighting program as it was thought he could not handle the routines or choreograph. He befriends Andie and later joins her crew.